The life of a courier involves a lot of driving, delivering large shipments and smaller packages and letters across the country. Modern technology like state-of-the-art vans and high quality roads allow this process to be completed at great speed – it is possible to cross the United Kingdom from south to north in under 24 hours, although this would require a pair of couriers taking shifts. Today’s couriers might be surprised to know that several thousand years ago, the Ancient Persians had some similar ideas about efficient deliveries. The Persian Empire (c. 550-330 BCE) was vast by ancient standards, reaching from Aegean Turkey in the west to the beginning of India in the east, at its height. The King ruled over it all; although he entrusted local government to his satraps, he still wanted to know all the important news in a timely fashion, especially when it concerned invasions, plagues, famines and so on. Ancient couriers needed to cross the empire as fast as possible with this news. But the journey across the empire, from Sardis to Susa and further, took up to 90 days on foot. A walking courier was far too slow for vital communications. Mounted couriers were faster, but still faced restrictions like the need to rest their horse, and the hazardous terrain that forced the horse to walk almost as slow as a human for fear of crippling injury. King Darius I’s solution was to build a 1,500-mile long road – the Royal Road – which traversed the empire, and establish 111 posting stations along it. Each station kept fresh horses for the couriers to change onto, ensuring that they could ride as fast as possible. The journey across the empire now took a mere 7 days. Herodotus’ writings – along with archaeological research and other historical records – have also furnished us with the Royal Road’s route, so that we can now follow those ancient couriers across the ancient empire. The Royal Road began in Sardis, above 60 miles east of present-day Azmir in Aegean Turkey. From there it went east through the middle northern section of Turkey and passed through the Cilician Gates to Nineveh (present-day Mosul in Iraq), formerly capital of Assyria. It then turned south to Babylon (near present-day Baghdad, Iraq), where it divided. The first route went northeast then east through Ecbatana and along what later became known as the Silk Road. 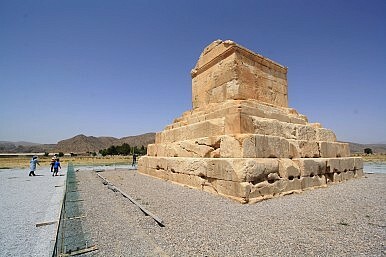 The second went east to Susa (in present-day Iran), future Persian capital, and then southeast to one of Persia’s most famous cities, Persepolis. While King Darius I of Persia ordered the development of the Royal Road’s full length, it seems likely that he wasn’t the first ancient ruler to envisage a quality road connecting important parts of his empire. The Ancient Assyrian Empire, which existed in many phases from as far back as the 20th century BCE until about a hundred years before Cyrus the Great forged Persia, most likely had a hand in building one part of the Royal Road. Its route through Nineveh and Babylon, old important centres of that Empire and not the most direct route across Darius’ empire, is strong evidence for the Assyrians devising infrastructure for ancient couriers even earlier in history, and the Persians simply expanding from it.